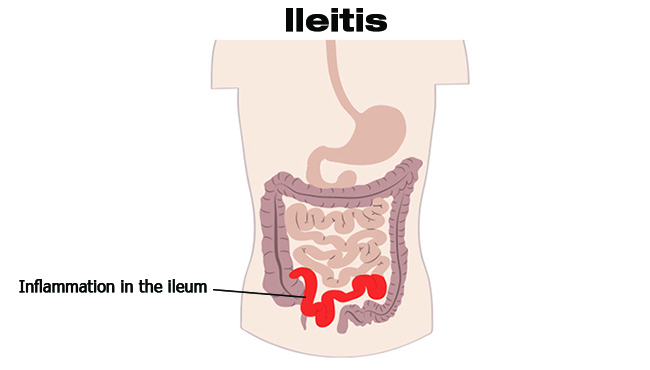 Ileitis is a rare condition in which there is an inflammation of the ileum. It is often caused by Crohn's disease. However, it may be caused by the variety of other diseases. The clinical presentation of ileitis may vary from an acute and self-limited form of right lower quadrant pain or diarrhoea, as in majority of cases of bacterial ileitis, but some conditions like infection by Mycobacterium tuberculosis follow a debilitating course complicated by obstructive symptoms, haemorrhage and extra-intestinal symptoms. Crohn's ileitis is a form of Crohn's disease and causes inflammation in the ileum (the last part of the intestine). Crohn's disease is thought to account for around 30% of cases of Crohn's disease. It is considered among the groups of Inflammatory Bowel Disease (IBD). It is common for people with Crohn's disease to be diagnosed with more than one type of the condition if inflammation is present in several places in GI tract. WHAT ARE THE SYMPTOMS OF ILEITIS? In some people with Ileitis, only the last segment of the small intestine (ileum) is affected while in other cases, the disease is confined to the colon which is a part of large intestine. The most common areas affected by this disease are last part of the small intestine and the colon. Cramping pain in the right lower part of middle of the abdomen. According to modern medicine, the exact cause of ileitis is not known. Previously, diet and stress were suspected, but now doctors know that these are the factors that trigger ileitis but don't cause ileitis. According to Ayurveda, ileitis is caused when Vata dosha is pushes pitta dosha into the colon causing inflammation. The nervous system controls stress response. When stress is high from an increase of stimulation from prana, the first signs of the development of Crohn's disease are seen. The patient, at this stage may experience early symptoms of digestive upsets such as gas and constipation, patient may have mild systemic dryness and feeling of weakness. As the disease continues, white blood cells invade the intestinal lining and produce inflammatory toxins causing chronic tissue swelling, injury and ulceration. Ayurvedic treatment includes the treatment of Vata and Pitta in the digestive tract throughout time of the treatment because ileitis roots back to sensitivity towards stress and anxiety. These are herbal tablets which are prepared from the herb Kutaja (Holarrhena antidysenterica). This herb is very effective to treat diarrhea in Ieitis. Apart from these it also helps to remove the toxins (Ama) from the body. This herb helps to balance the vata and pitta dosha. It removes toxins from the body and provide relief from painful condition of colitis and smoothens bowel movement. Its tannin content has ability to overcome severe inflammation and heals the ulcers. 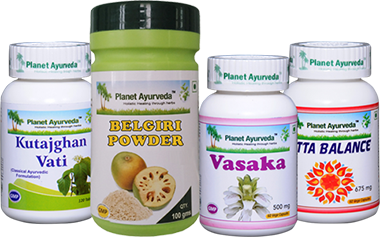 It helps in various disorders like IBD, IBS and Bowel movement. Praval pisti (Coral calcium) - It is found at sea bed and it is rich source of calcium and It helps in balancing pitta dosha and provides calcium to body. Akik pisti (Agate calcium) - It helps to balancing vata and pitta doshas and effective against vata and pitta doshas related problems. Jawar mohar pisti (calcium compound) - It is the natural source of calcium. Mukta pisti (Pearl calcium) - It helps to balance the pitta vitiated conditions. Giloy (Tinospora cordifola) - It helps to balance all three doshas of body and enhance immune system of body therefore it provides complete health. These are herbal capsule obtained from the standardized extract of Adhathoda vasica. This herb helps to balance the kapha and pitta dosha. It helps in various problem like respiratory problem. Along with the treatment, life style modifications like good sleep, stress free life, healthy eating habits such as wholesome food at right time and in right quantity must be followed. Junk, spicy and stale food is not recommended along with the treatment because if a person suffering from ileitis keeps on taking pitta aggravating foods, many complications will take place causing the disease more serious.